To be completely honest I haven't actually watched the whole bossy video, but I've been following all the debate about it in the media. The bossy thing doesn't really interest me as much as the appearance stance does. I remember words from my own childhood and voices that still come up every now and again. I do my best to be conscious with language, too... I find myself sounding like my mum far more often than I would like to, but I have to remember to be gentle with myself in those times, too. All we can do is our best. I find myself sounding like my mum too often too, but thankfully its just all her random sayings and not the negative stuff. Love this post Toni...that's terrible that you had to (and have to) put up with a caregiver apologising for you --- does make you question yourself and in some cases, people question their existence. I see so many clients these days who have been told things by parents and caregivers that stick with them and they do have that internal monologue that invalidates them and continues to tell them they are not good enough. I am hoping to write a post on not good enough. Yep definitely makes you question yourself. It has come up in my sessions with my psychologist along with all the other stuff thats gone on in my life. I swear she wants to write a book about me shes so intrigued by my life story. However we have both determined that I'm extremely well adjusted given my upbringing. Which is a positive. And yes - great minds! Toni, you is an awesome mum! I was an anxious kid, and like you I'm all too aware that I am the most powerful role model my children have so I try not to let them see the anxiety breaking through too often. Yea from what I know her father (I was 5 when he died) was very strict. She was an only child because he wouldn't let my nan have anymore children. She was also sent to boarding school so as an adult now I can somewhat see why she is so cold. Thank you for this post. 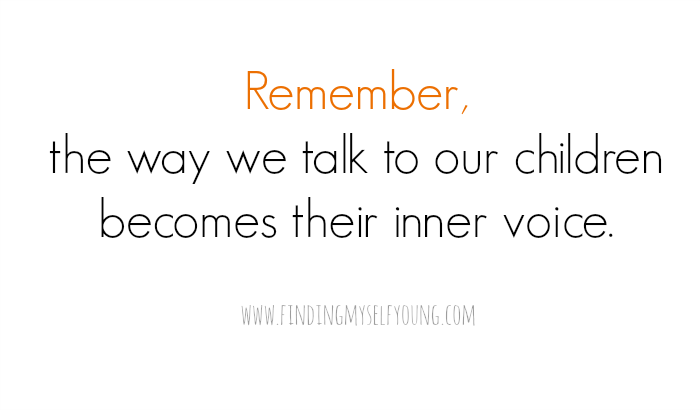 You are so right that how we were spoken to as children and adolescents sticks with us for the rest of our lives. In an attempt to be kind to her when she was absolutely NOT to me, I will only say that my mother did not filter her words or criticisms to me and that has born in me some trust issues that I now have to fight in order to have a relationship of any kind with anyone. Have you ever heard of the Orange Rhino Challenge? She does deals with stuff like this on her blog all the time. I'd never heard of The Orange Rhino Challenge before, but I've bookmarked it to read now. Thanks for letting me know about it! I couldn't agree with you more about this topic. If only more parents were more like minded. I wish more parents felt the same too. I see the way some kids are spoken to when we're out and I feel so bad for them because I can see it from their perspective. I LOVE The Help. Such a good story line and message. Oh, I loved that book! Just read it last month. I can't decide about the bossy thing. I do actually think there's a difference between being bossy and being assertive and all the other more positive terms so I need to think on it a bit more. Yea I don't really have a particular stance on the bossy issue either - I just think its good that its bringing the debate about how we talk to our children to the forefront of people's minds. Geez it's so hard to keep all these things in mind after a long day and 3 children are going nuts at you, BUT I do make an effort to always praise good behaviour and alternatively say what they DID was naughty, not that THEY are naughty. I can totally forsee days where I will be tired and frustrated and this wont be in the forefront of my mind, but as long as I do my best to stick to it for the rest of the time I'm ok with that. Beautifully said. I try to be as enthusiastic as possible when my boys achieve something. I also like to ask them, "Who's a clever cookie" and they give me a huge million dollar smile and say, "Me!" I always feel sad when I'm out and there are parents swearing and yelling at their kids. I often think of this clip while I'm talking to my girl. I still tell her she's pretty, and cute and beautiful, but at the same time I tell her that she's beautiful on the inside which is the most important. I tell her a lot that it doesn't matter how beautiful you are if you're not a nice person and you don't care about hurting peoples feelings. And she does, she's a big bundle of caring empathy but I cant take credit for that - I think it's just her character. It does however leave her vulnerable to other kids who aren't as nice and we're working on that too. I'm sorry your Gran was so hard on you - I think sometimes people are just not natural nurturers, like some people aren't good at math, it's so hard on the ones in their care, but its also so sad for them because they're missing out on so much happiness. Gee where have I been, I haven't seen this bossy campaign. I do agree though, as an adult now I can recall how much words affected me as a younger person. Although I'm not so sure how I feel about not using the word 'beautiful' with girls...I think there should be more of a focus on the fact that there can be inner beauty and not just looks and that this is what counts. With 4 girls, two of them teenagers, "bossy" seems to me to one of the most tamest names that they call each other. Having said that, I am trying to encourage them to know their own minds and to be assertive rather than "bossy", let's see how I go! I love that quote and that scene from The Help!!! I totally agree with you and sadly hear and see the effects of negative self talk and negative comments from family members all the time in the lives of children I work with! Wish people were more aware of the harsh effects of it! Sounds like you are doing a wonderful job with your little girl! She's just gorgeous! First off I want to say Toni, you sound like a great, conscious parent. Go lady! I too have been on the same mission to speak with respect, compassion, patience and love to my daughter at all times. Empathy, is understanding without evaluation.